If you enjoy listening to music while you study, while you work, or if you simply enjoy meditating with music in the background, you will find the music from Wholetones to be soothing, stress relieving, and energizing. Click here to learn more. This beautifully orchestrated production of Lamb Of God by the London Symphony Orchestra will lift and inspire. No matter what Christian denomination you belong to, you will love this! The motifs are very clever, and the feeling the composer and symphony put in it are astounding, especially on the songs "Make Me Whole" and "Lord, is it I?" "Gethsemane" is another great piece, with the cello representing the Lord. Wonderful messages from the last week of the Savior Jesus Christ. Available on Amazon. The literature books from A Beka book contain a compilation of classical short stories and poetry that your children are sure to enjoy. The complete A Beka collection for this age group includes Of People, Of Places, Of Themes, American Literature, World Literature and English Literature. 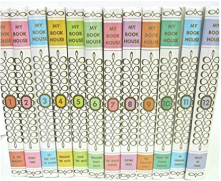 Having this collection of short stories and poems on your library shelf will provide easy access for your family's enjoyment.